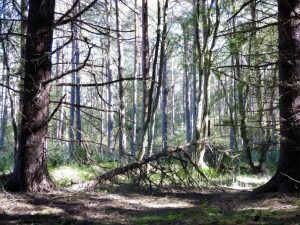 You are here: Home > Blog > Woodland Activities > Why buy a small wood? The woodland we have has been commercially thinned, fifteen or so years ago, leaving us now with many strangely formed mature trees (bent and twisted with double leaders) and a substantial self-set understorey comprised of regenerating spruce, from the erstwhile commercial planting, and the ubiquitous native birch (Betula pubescens) and goat willow (Salix caprea). Clearly the best commercial timber appears to be gone; that which remains is certainly more interesting aesthetically which suits our purposes ideally. Through careful thinning, and new planting we aim to extend the tree species range and thereby the overall bio-diversity of the wood. Of any felled material, the branch wood will be converted to wood chip (reducing any fire risk) and the timber will have some small return as firewood, pleasing our accountant. 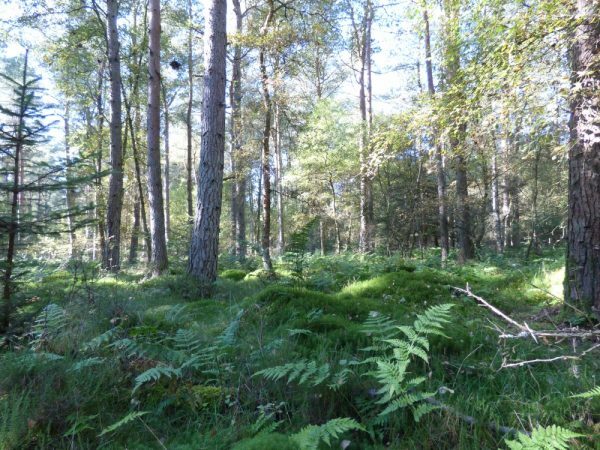 Timber not suitable for the fire will be retained on site and combined into discreet heaps to accommodate wildlife; where safe to do so standing dead stems will also be retained to contribute to bio-diversity. We look forward to putting into practice unrestricted management regimes and observing what happens - hopefully what we expect! 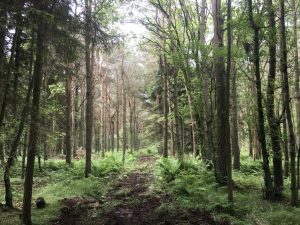 How to make a woodland pay? What activities? Paintball, truffles, shooting, fishing, camping,educational? A significant portion of my small woodland was hybrid plantation poplar, set in regimented rows after clear felling 20 years earlier. A monoculture with struggling self seeded natives spindled and deformed in an almost lifeless and dark environment. Slow and systematic removal of the poplar, some felled and others ring barked, with some small scale planting of Crab Apple, Rowan, Oak complimenting self seeded Wych Elm, Birch, Hawthorn. 12 years later with glades, log piles, standing deadwood, nest boxes and a tiny pond, I have Barn and Tawny Owl, GS and Green woodpecker, Sparrow Hawk, Buzzard, most of the titmice including Willow. Warblers and dragonflies in summer along with bees and butterflies. Offer nature space and a food source, and watch it come. Many words can be used to describe the climate in Cornwall. “Dry” is not one of them. ..have been thinking/looking at woodlands for a while, like having a river or a lake/pond and even building a pontoon, shed or a treehouse to live and DIY tree management for self. Is Cornwall the best for warmer/dry climate? I’d think carefully about what you are buying a woodland for and then try to match what’s available with your objectives. Many people are looking for somewhere to camp in which case it’s important to have some flat area and plenty of shelter. Others are more concerned with looking after trees in which case you should get a woodland where there is plenty to do. The best way by far to get a feel for what you like and don’t like is to go and visit a few woods on the market. We are thinking of buying a wood. Do you have any tips for us to consider?